My old uniform, originally uploaded by odelapaz. Yup. 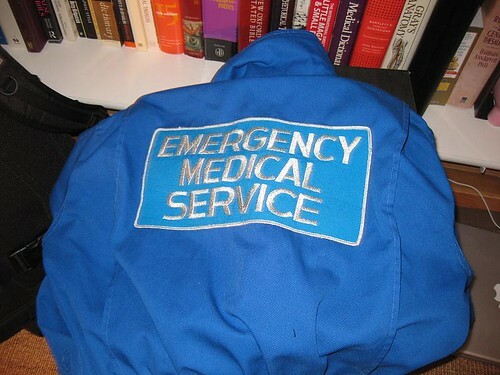 My old EMS uniform. Just above it, you can see a Grey's Anatomy book and a Medical dictionary. Ah, my past life . . . I was just asked an interview question about how much the past creeps into my poems. In the previous collections, not so much, but now I'm all about writing about the past. I helped my parents move some stuff out of their new office. The cabinet makers are coming tomorrow, so I had to clear out an area in the room. My EMS uniform was draped over a box of my old cartoon books---you know, Peanuts excerpts and Garfield cartoon books. I had a ton of those as a kid and my parents kept 'em. Anyway, about this EMS uniform. Of course I tried it on. It was . . . painful, to say the least. I've gained quite a bit of weight and bulk since those days. If you must know, I was an EMT in LA Count for the better part of two years. Not my thing, but it certainly helped me discover my true path. I taught my last lecture class of the quarter today. Technically it was a review for the final. Of course, the students didn't ask any questions. Rather, they tried to lawyer me into reducing the length of the exam. I sort of caved, for a portion. I realized, I really didn't want to grade two long essays, so I cut one of 'em. That only means that the one long essay they have to craft is worth a heck of a lot more. Their fault.